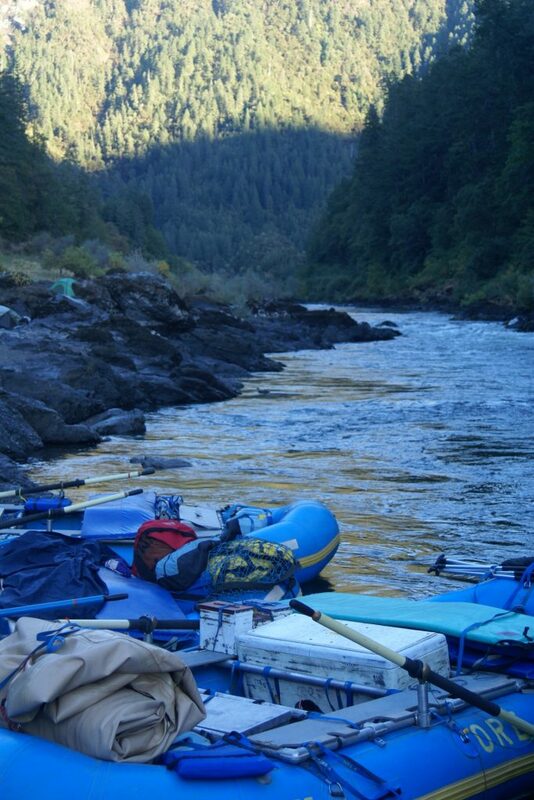 Enjoy two of Oregon's best exports river rafting and craft beer with Oregon River Experiences along with Lompoc Brewing for a 4-day trip down the beautiful Wild & Scenic Rogue River in Southern Oregon. Each day you float downriver in rafts and inflatable kayaks 6-12 miles, splashing and laughing your way through the many rapids of the Rogue. During the day learn about the historic river while keeping an eye out for black bear, bald eagles and river otters. Enjoy delicious riverside lunches during the day and arrive in one of the breath taking riverside campsites. Afternoons in camp brings options to hike, swim, relax or play a game of bocce ball. Come evening time sit down for appetizers and learn about Lompoc's brewers selection for the evening, while sipping out of your new ORE river pint glass. Enjoy the specially designed menu made to highlight the brewers selection and enjoy delicious desserts as the sunsets over the canyon and the stars come out to shine above the river. The Rogue River is a classic multiday river trip and craft beer is a Oregon classic, we think it only makes sense that they go together. Join O.R.E. and Lompoc Brewing as we take a slight twist on the regular O.R.E. river trip, by bringing the head brewer from Lompoc Brewing some of their tasty brews and a specialty designed menu specific for that trip's beer offerings. The Rogue is a strikingly beautiful stream that cascades through a exquisite canyon mantled in Douglas fir, western hemlock, oak and madrone. Fern grottoes, beautiful sandy beaches, sparkling waterfalls, lovely side streams, translucent swimming holes, historic homesteads, and exquisitely carved rocks combine to create a place that's pure magic. The Rogue River canyon is home to black bear and raccoons, to river otter, deer and mink, to salmon and trout, and to osprey, blue heron and bald eagles. It's wild country and wildlife is everywhere: perhaps more wildlife than you're likely to see from the water anywhere in the USA outside of Alaska. The rapids are equally wild: from boulder gardens and narrow chutes to long wave trains and turbulent currents beneath spectacular canyon walls. We encounter numerous challenging but forgiving class III rapids on our journey, including Tyee, Wildcat, Black Bar Falls, Horseshoe Bend, and Devil's Staircase. Two spectacular class IV rapids — Mule Creek Canyon and Blossom Bar — are trip highlights. The rapids are great fun, but there's more here as well. Time and conditions permitting we stop to explore the swimming holes at Howard Creek, Mule Creek or Big Windy Creek, pay a visit to an historic ranch or a gold-rush era cabin, or stop for a picnic lunch at the waterfalls and jumping rocks at beautiful Flora Dell creek. We meet at 8:30 AM on the day your trip begins at the Galice Resort Cafe. The Resort is situated along the banks of the river not far from the town of Grants Pass. Galice is roughly 400 miles north of San Francisco, California, and 250 miles south of Portland, Oregon. (Please have your breakfast before our meeting time, and arrive Rogue river morning in your river clothes.) Our Lead Guide will meet you in front of the cafe and store. Look for a vehicle sporting the O.R.E. logo. If in doubt about where to find us, ask a Galice employee at the store, and they will assist you. After a brief orientation you will pack your things into our river bags, and park your vehicles at Galice. We will then go by van to the launch site a few miles downstream. Depending upon trip length and water level, we begin our river trip at either Almeda Bar, Argo Bar, or Grave Creek boat ramp. Once we arrive at our launch site, you’ll meet the rest of our guide crew, and they’ll conduct a short safety and orientation briefing, which will include instruction on paddle and rowing techniques as needed. We’re normally on our way downstream by mid-morning. Each day is a bit different. But a typical day on the river begins with freshly brewed coffee around 7 AM, and breakfast by 8 AM. After breakfast we’ll pack our bags and load the boats. Then, after a brief orientation to the day’s adventures, we’ll head downstream. We’re on the river an average of four hours per day. Along the way we stop for a riverside picnic lunch. We may also stop to swim, to explore historic sites, to scout rapids, or hike up scenic side streams. We usually arrive at camp by mid to late afternoon, and while the guides or prepare hors d’oeuvres and dinner, you’ll have time to hike, swim, fish, read, or nap and sample the evenings featured beer. We typically arrive at Foster Bar, our take-out point, between 1:30 and 3 PM. Once we’ve unpacked, you’ll board a van for the ride back to Galice. (On small trips, we will completely de-rig the boats, and our guides will accompany you back to Galice. On larger trips, you will say good-bye to the guides when you leave Foster Bar, as they will stay behind to finish de-rigging.) The ride takes about two hours, on scenic Bear Camp Road through the Siskiyou National Forest. Climbing 4,000 feet through mountainous terrain before descending to Galice, it’s a beautiful drive. (It is also a winding road, so if you’re particularly susceptible to car sickness you may want to bring Dramamine.) We arrive back in Galice between 4:30 and 6:00 PM. All meals, from lunch on the first day through lunch on the last. Our specially paired menu for the featured beers of the trip are delicious, fresh and hearty. Meals are prepared in riverside by our guides from the highest quality ingredients. Juice and water are available at each meal. Coffee, tea, and cocoa are available at dinner and breakfast. Take home O.R.E. Metal Pint Cup along with the evenings featured beer for appetizers and dinner. Special dietary needs may be accommodated with advance notice. We provide cups, plates, and silverware and etc. Tent, sleeping bag, sleeping bag liner, sleeping pad, camp chair. Your trip fare includes transportation from Galice to our put-in point, and from our take-out point back to Galice at trip’s end. If you’re planning to drive up or down the Coast after your river trip, you may wish to leave directly from takeout. When we meet in Galice on put-in day, your guides can assist you in arranging to have your car shuttled to takeout. Galice Resort conducts these shuttles, at a cost of approximately $115 per vehicle. Fishing on the Rogue is fair to good during spring and summer and good to excellent in the fall. If you would like to fish you will need an Oregon fishing license, which may be purchased at Oregon sporting goods stores, at the Galice Resort, or online at the Oregon Department of Fish and Wildlife's web site. We select beautiful beaches, meadows, and forest glens for our camp sites. Our guides establish a central kitchen and social area, and trip members select spots in the surrounding area to pitch a tent or roll out a sleeping bag. Most camps are equipped with outhouses, while at other camps O.R.E. will set up a portable toilets. O.R.E. practices minimum impact camping, and the crew will instruct you on the simple steps we follow to protect the river. Rustic cabins and a lodge are available at the Galice Resort. Phone 541-476-3818. Also nearby is Morrison’s Lodge (800-826-1963). Camping is available nearby at Indian Mary Park and also at Almeda Bar Recreation Area, both within 5 miles of Galice. Reservations for both can be made through at www.reserveamerica.com. While in the area you may want to visit Crater Lake National Park, Oregon Caves National Monument, or the southern Oregon coast. You may also want to visit the nearby towns of Jacksonville and Ashland. Jacksonville, a National Historic Landmark, hosts the Britt Music Festival on weekends in July and August. The Britt Festival features classical, jazz, and bluegrass music under the stars. For information contact the Festival at 800-882-7488. Ashland is site of the renowned Oregon Shakespeare Festival. Because Shakespeare Festival performances often sell out, we recommend that you call well in advance for tickets and information (541-482-4331).